I have great news to share: I've been accepted to Mixed Media Card Challenge design team! For a mixed media enthusiast like me this is a great opportunity, and I can't wait to get to know all the super talented ladies in the team. 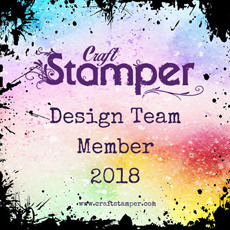 I can assure this team will rock, and inspire you with beautiful card projects - hop over to MMCC blog and read the team member introductions here and here. In July we ask you to create a mixed media card with a touch of nature. If you wish, add a tag on your project, but this is an optional element and can very well be left out. 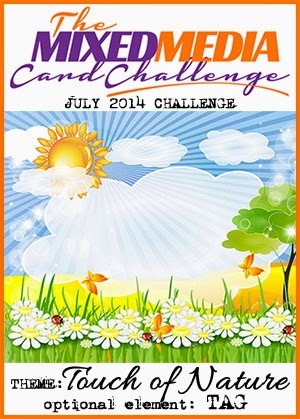 Read the simple challenge rules here, and join us for mixed media card making fun! I love to create textures with dry embossing and inking. For this card I did not want to emboss the entire background, but only the area in the middle. Therefore I put a piece of heavy office paper (220 g/m2) between an embossing folder, placed it on table, and pressed it down hard with my hands. For sure the embossed image is not as clear as when you emboss with a die-cutting machine, but still visible and good enough for coloring with inks. After inking I splashed some water on the inked surface and dried the splashes with a heat gun. 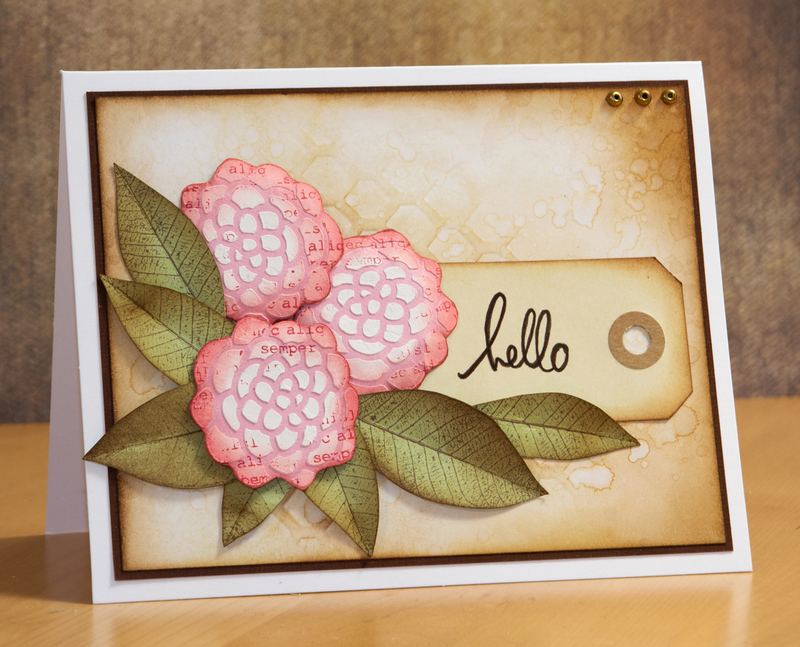 The flowers are stenciled with white texture paste on pink cardstock, cut out, inked, and stamped with red StazOn ink. The leafs are stamped on green cardstock (stamp by 3rd Eye), cut out, inked on the edges, and folded in half. 'Hello' sentiment stamp is from Heidi Swapp collection, and after stamping it on a small manila tag, I reinforced the text with a brown marker. I can't wait to see what you create! Happy crafting! What a beautiful soft looking card! Your stamping with the embossing folder is a wonderful background. What a great background you created Elina! love the look of the creased leaves too! Beautiful texture and flowers! So glad to be on the team with you! Thanks Charlene! :) I'm looking forward to seeing more of your creations, too! Thanks Loll! :) Looking forward to being inspired by your projects, too! The BG you created is so gorgeous, those leaves look real :) so happy to be on the team with you ! 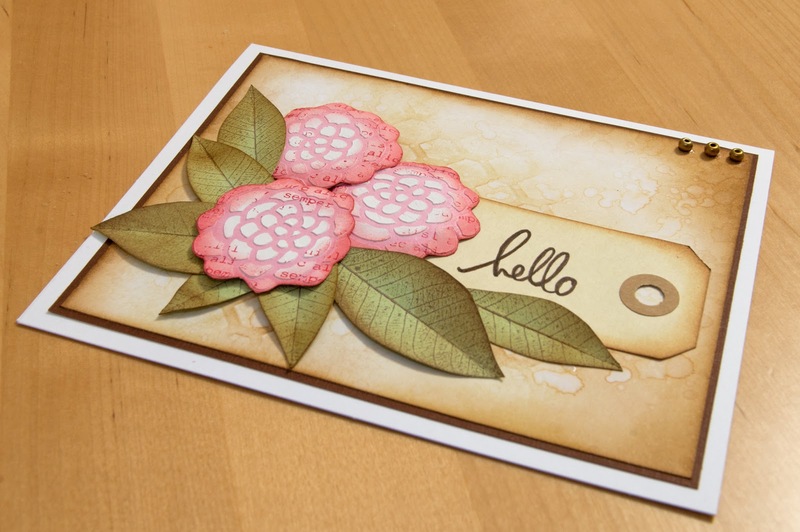 I love the earthy, soft look of your card, Elina! I'm totally crushing on that partially embossed background you did (thanks for the tip!) and those leaves are gorgeous! So glad you're on the team -- you rock at mixed media! Shery, thanks for your sweet comment! :) And thanks for this great opportunity - we'll have so much fun!! Lovely card! That's a great background and wonderful flowers! Glad to be on the team with you! I just love the idea of being your own embossing machine! Fabulous idea which I will be trying! I also love the texture paste on the flowers! Can't wait to see more of your creations! Thanks Jen! :) You totally rocked the challenge with your colorful butterfly card! Thank you Lyndal! :) So happy to be on this team with you, too! Kiitos Sanna! :) Miten iloinen olinkaan nähdessäsi sinun nimesi tiimiläisten listalla. Tästä tulee kivaa!! 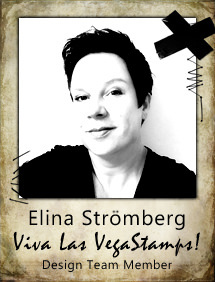 Congratulation on your DT post Elina. This card is awesome. Thanks Cara! :) I hope you play along this fun challenge! Thanks Shirley-bee! :) So happy to be in the team with you, too - you amaze me with your talent! Onnittelut! Kaunis kortti ja kiinnostava uusi tuttavuus tuo MMCC-haaste! Kiitos Salla! :) Toivottavasti näen myös sinun korttisi haasteessa!! Lovely card! The background is so soft and subtle. Thank you for sharing your process with us. Beautiful and inventive and wonderful and creative and I LOVE IT! Thank you Ingrid! :) I stopped by in your blog and was stunned by your talent! You've got a new follower, too!! 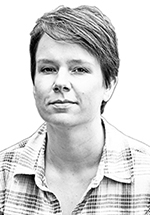 Onnea design teamiin pääsystä! Upea kortti! Elina, the colors on your card are so beautifully soothing. I love the effect of the partial embossing. And the idea of using texture paste on colored CS - I haven't tried that yet. 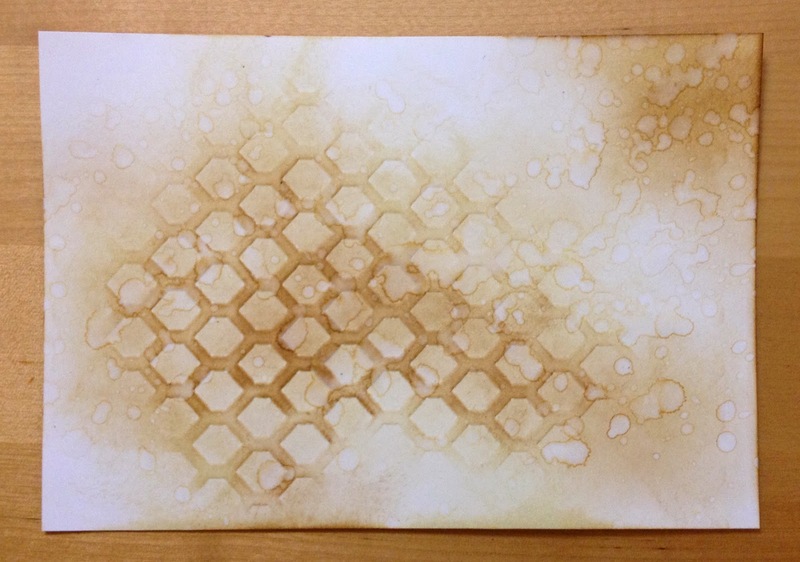 I was thinking about trying the texture paste on patterned paper... would be interesting, too! Elina, what a striking design! Such an amazing background with the paste! Beautiful color palette also! 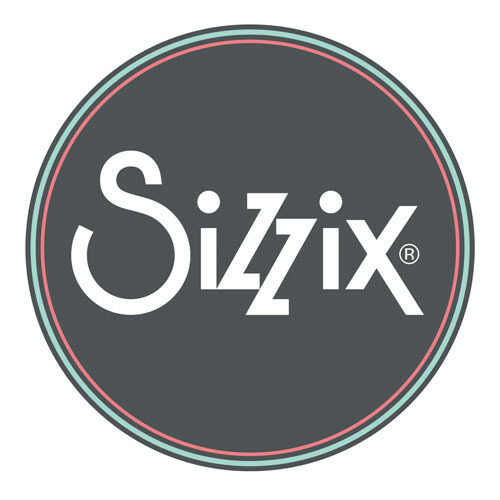 Flora Grande and Sizzix giveaway!